It was his impressive skills on horseback that inspired Englishman Philip Astley to forge a career as a showman. Astley was so talented on horseback and at wielding a sword, that after being discharged from the British Army at the end of the Seven Years’ War in 1763 he turned to performing publicly. He opened his own riding school in London and quickly gained a reputation for his daring feats — which nearly always ended with a re-enacted battle scene. After two seasons, the audience wanted more. Astley enlisted the help of other performers — acrobats, rope-dancers, jugglers, and clowns — and the circus was born. This new style of theatre quickly gained popularity, and competition wasn’t far behind. One of Astley’s former troupe members, Charles Hughes, formed a new group and headed to St. Petersburg, Russia in 1793. That same year, one of Hughes’ equestrian students, John Bill Rickets, opened the first circus in the United States — in Philadelphia. When Rickets went to America, the concept of ‘circus’ was split in two. In Europe, circus was at first always held inside a building — and every major city had their own lavishly decorated and permanent space. Indeed, between the two World Wars, Paris alone had four permanent circuses. However, in the developing nation of America, this wasn’t possible. The groups had to travel long distances to keep drawing in the crowds, and there was no guarantee of a building big enough at the end of the road. In 1825, Joshuah Purdy Brown invented a collapsible canvas tent, known as the ‘Big Top’, which allowed circuses to travel between the new and developing cities and set up shop anew in each one. It wasn’t easy though. Troupes travelled at night in wagon trains and could only make it up to 25 kilometres at a stretch. A rider forged ahead and marked the shortest path by placing rails from farmers’ fences across the path to stop the trains taking a wrong turn. This nomadic lifestyle has always been at the heart of the circus. It didn’t take long for these practices to stretch beyond Europe and America. By the 1850s, Italian equestrian Giuseppe Chiarini had established a circus in Havana before zigzagging across the world to Japan, Mexico, Chile, Argentina, China — and then down to Australia, New Zealand and Singapore. Similarly, the Cooper & Bailey Circus toured Honolulu, Fiji, Australia and New Zealand between 1876 and 1878. The bicycle balancing act of the New Shanghai Circus. Photo courtesy of New Shanghai Circus. 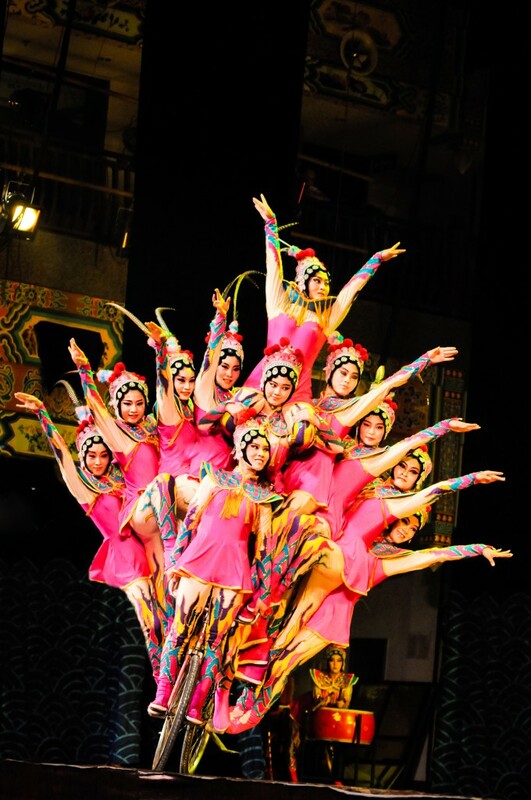 Even though acrobatics is a 2500-year-old tradition in China, it was equestrians who introduced it to the circus. They would balance, somersault and juggle atop horseback. By the mid-1800s, clowns were often the best at floor acrobatics. As well as singing, riding a horse, juggling and appearing with wild animals, they could balance and tumble with the best. In the 1850s, English clown Little Wheal became famous for regularly performing 100 somersaults in a row. Soon, things moved upward. Tightrope walking became hugely popular, eventually giving rise to the trapeze. By the end of the First World War, equestrians in circus were a thing of the past, and with the introduction of the three-ring act, clowns became mute performers of visual gags. It was the aerial acrobats who now shone as stars of the show. Tightrope walking and the flying trapeze became the crowd favourites — and the performers became legends. The inventor of the flying trapeze, French gymnast Jules Leotard, became a celebrity in Europe — as much for his performance as for his revealing costume, which has since become the norm for acrobats. The first elephant to join the circus was a female African elephant called Old Bet. She was bought in auction in London for US$20 and sold to Hackaliah Bailey from New York for US$1000. When she berthed in America, Bailey walked her to her new home, 90 kilometres away — but doing so only at night, so the public wouldn’t get a free show. During the day, he would charge people to see her. Even Old Bet’s death in 1816 didn’t stop Bailey from displaying her. She was stuffed and preserved, and toured New England for 4 years. Soon enough, more wild animals were being put on display. By 1833, the original lion tamer, Isaac Van Amburgh, would dress like a Roman gladiator and step into the lions’ cage. He dared them to attack, all the while beating them into submission with a crowbar. The performer would also bring a lamb into the cage — and at one stage, a child from the audience — to prove his control over the animals. The media were hugely critical of Van Amburgh’s treatment of the lions, but the audiences kept coming. In the late 1820s, small ‘freak shows’ began appearing in America and England. It was in 1871, though, that these exhibitions of human as well as animal ‘oddities’ reached their pinnacle of popularity, when Phineas Taylor Barnum took to the road in America with his ‘Greatest Show on Earth’. This was the biggest circus in the world at the time, requiring 500 people and 600 horses to take it from town to town. Many of Barnum’s ‘freaks’ have since been immortalised: The Bearded Lady, The General Tom Thumb, The Tattooed Man and The Dog Faced Boy. Perhaps most compelling is the story of the original Siamese twins, Chang and Eng Bunker, who were born in Siam (Thailand) in 1811 and toured with various circus companies before ending their career as part of Barnum’s troupe. When they retired, they settled in North Carolina, married sisters and fathered a total of 21 children. Chang died of a stroke in January 1874, and Eng discovered his death the next morning. By the time the doctor arrived for an emergency separation, Eng had already died. The quite different circus we know today has been shaped by several factors. The World Wars put pressure on the labour force and many circuses simply went under. Audiences were also shifting their attention to the growing culture of cinema and festivals. Those circuses that survived these changing trends downsized dramatically and looked at ways to reduce costs while maximising entertainment. It was Russia, though, that forged the new path focused on gymnasts and acrobats. 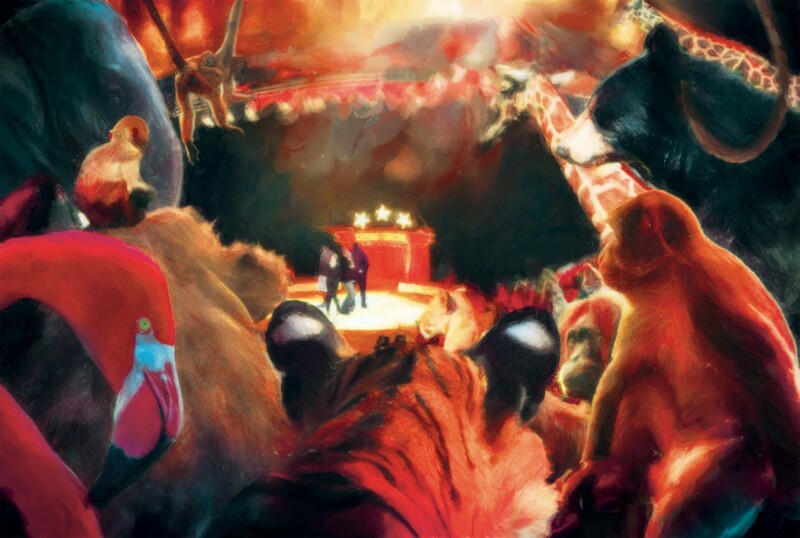 When Lenin nationalised the Russian circuses in 1919, the Moscow Circus School was formed. By the 1950s, its performers were considered to be the best in the world — both in terms of technique and originality. Public opinion has also shifted in relation to the use of animals for entertainment. The audience no longer want to see ‘the taming of beasts’, but instead prefer to witness the physical prowess and skill of athletes, combined with engaging narratives and exquisite production values. The international popularity of Cirque du Soleil is a prime example of this. The show has inspired other groups to work on a similar narrative foundation — but with their own distinctive ‘twist’. For example, the French heavy-metal circus, Archaos, entertained in the 1980s and 90s with chainsaw juggling, explosions, and the ‘wall of death’. An act from Kurios – Cabinet of Curiosities, Cirque du Soleil. 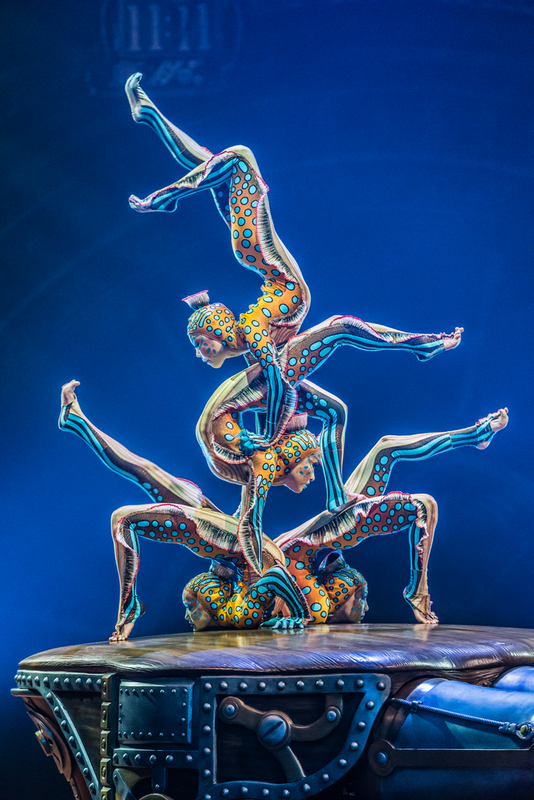 Photo courtesy of Cirque du Soleil. Combining the power of modern machinery with traditional daredevil antics, Nitro Circus has also found growing fame by performing jaw-dropping feats of FMX, BMX and skateboarding. The show is led by American icon, Travis Pastrana — the first person to do a double backflip on a motorbike — and features a line-up of internationally renowned freestyle athletes. Today, circus is as varied and interesting as our imagination allows. A day at the circus proves to still be as entertaining and whimsical as it was two centuries ago.